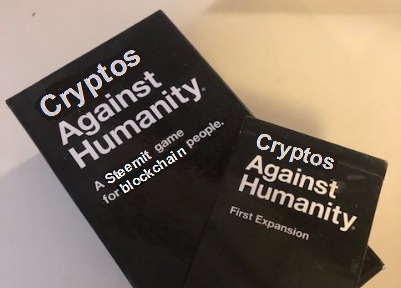 Definitely *Not* A Cards Against Humanity Contest - Week 13steemCreated with Sketch. Hello again, contestants! We made it through Week 12 without getting pulled into the Great Flag War of 2018, and now we're back for Week 13! At least the price of Steem hasn't dropped even further, so we can still afford... well OK basically nothing. By @yintercept. Congratulations! 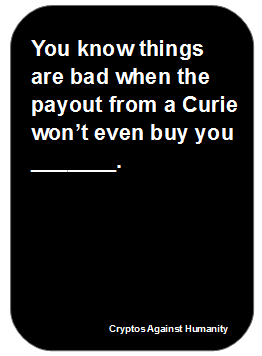 Because come on, those things are basically free. 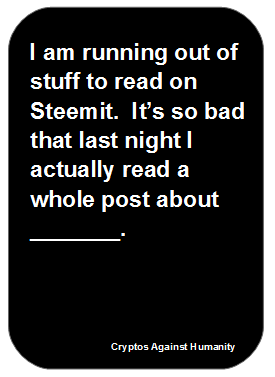 I am running out of stuff to read on Steemit. It’s so bad that last night I actually read a whole post about _______. @ropaga has earned 0.29 STEEM. 0.29 STEEM from the community! @newbiegames has earned 0.275 STEEM. 0.275 STEEM from the community! @acolucky has earned 0.238 STEEM. 0.238 STEEM from the community! @isarmoewe has earned 0.062 STEEM. 0.062 STEEM from the community! the creature hat tasted sound. That was a surprising article because I've spent the last eight months compiling an extensive profile of all StemIt users which I intend to sell to Vladamir Putin to help Trump with the next election. Maybe Wikipedia's random article function isn't random after all? hidden extras found in certain rooms. I love collecting tokens and shares! Even if they have no nominal worth! I like the idea of numbers going up! Thank you RNG gods! In our last Algorithmic Curation Round, consisting of 201 contributions, your post is ranked at #96.